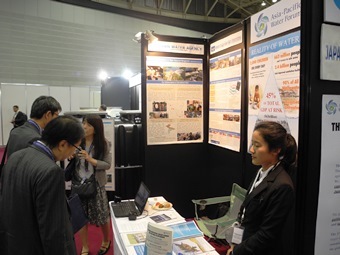 The ADB 50th Annual Meeting was held in Yokohama, Japan from May 4 to 7. 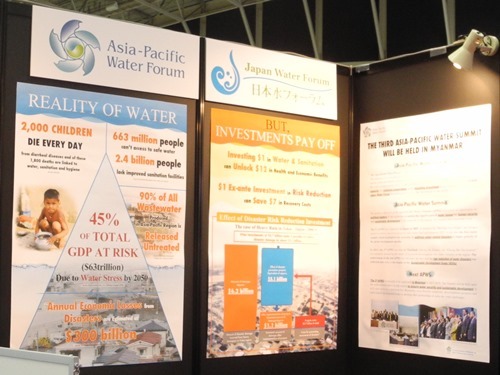 JWF appealed to the government officials and financial institution representatives of ADB member countries to recognize the importance of increased ex-ante investment in water infrastructure at the exhibition booth and also introduced APWF activities including the preparation of the 3rd Asia-Pacific Water Summit. ADB, based in Manila, is dedicated to reducing poverty in Asia and the Pacific through inclusive economic growth, environmentally sustainable growth, and regional integration. Established in 1966, ADB is celebrating 50 years of development partnership in the region. It is owned by 67 members - 48 from the region. ○ADB announced the establishment of a trust fund to promote the integration of high-level technology (HLT) and innovative solutions in the design and implementation of its projects in Asia and the Pacific. The Government of Japan will be the first donor to the fund and will provide $40 million over 2 years. ○Approx. 40 Japanese private companies and organizations including Yokohama City exhibited Japanese technologies and products at the ADB Annual Meeting. 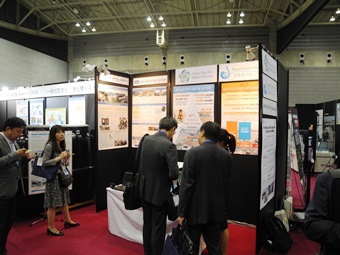 JWF had an exhibition booth jointly with the Japan Water Agency (JWA). JWF/JWA exhibtion booth The booth attracted many visitors from both public and private financial institutions.